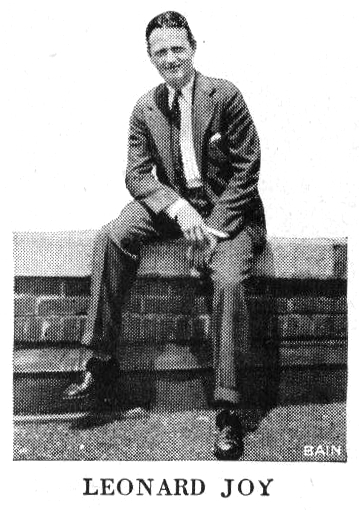 Leonard W. Joy, director of the High Hatters. From 1930 Victor catalog. This is not a tremendously remarkable record. It’s not particularly uncommon, and there’s no really fascinating story behind it. What is remarkable is the quality of the music recorded on it. Played by the High Hatters, it is in my opinion one of the best dance band records of the 1920s. The High Hatters were a Victor studio orchestra directed by Leonard Joy, an employee of Victor, much like Nat Shilkret. Joy directed a great number of bands for the company, including the Southerners, his All String Orchestra, and many uncredited bands backing musicians, but his most notable orchestra was certainly the High Hatters. The High Hatters are quite often cited as one of the finest dance bands of the late 1920s and early 1930s, a period that could arguably be considered as having the greatest dance bands overall. 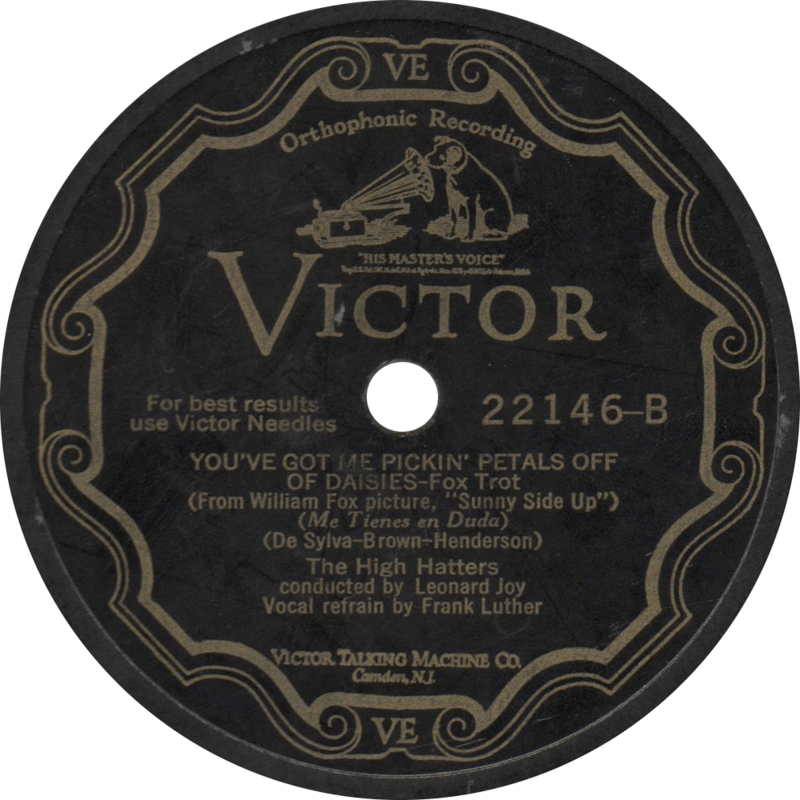 Please note that there were a number of other bands that also used the name “High Hatters”, such as Webster Moore’s High Hatters on the Columbia budget labels or Phil Hughes’ High Hatters on Perfect, but only the instances found on the Victor label are the band heard here, and even then, some from the 1930s were under a different director than Leonard Joy. 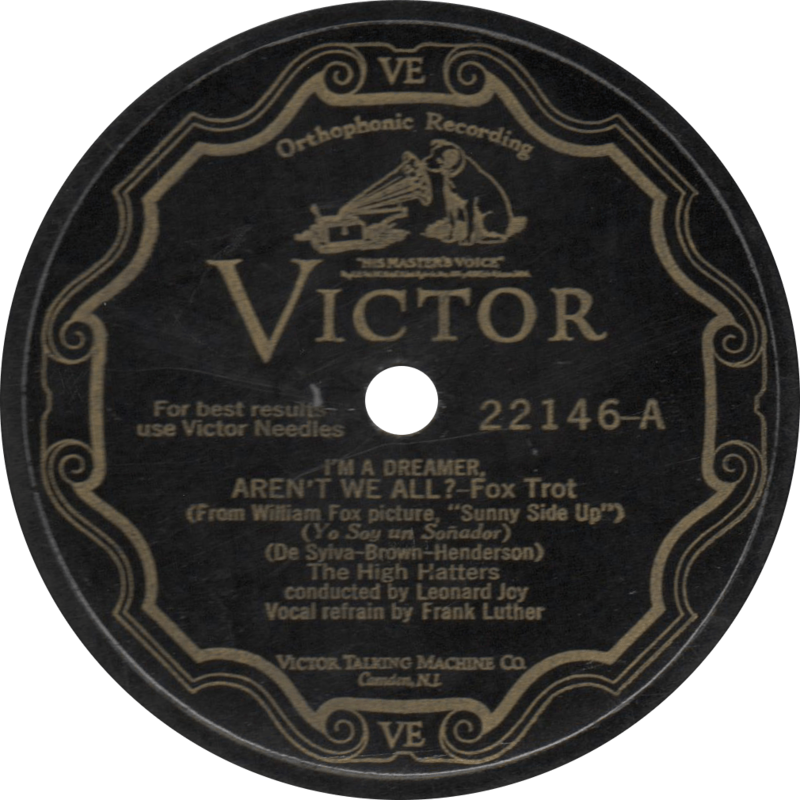 Victor 22146 was recorded October 9, 1929 in New York by the High Hatters conducted by Leonard Joy. The versatile Frank Luther sings the vocal on both sides, which feature a pair of DeSylva, Brown, and Henderson songs from the 1929 musical film Sunny Side Up, starring Janet Gaynor and Charles Farrell. I can’t remember exactly where I first heard this superb version of “I’m a Dreamer, Aren’t We All?”, I think it was part of a demonstration of a Victor Credenza Victrola, but I do remember that I was instantly entranced by its excellent arrangement, and you can imagine my pleasure when I turned up a copy of the disc at a store in Round Rock, Texas. I’m a Dreamer, Aren’t We All?, recorded October 9, 1929 by the High Hatters. On the reverse, they play “You’ve Got Me Pickin’ the Petals Off of Daisies”, another fine tune from Sunny Side Up, with a really nice banjo solo added to the mix. You’ve Got Me Pickin’ Petals Off of Daisies, recorded October 9, 1929 by the High Hatters. This entry was posted in Records and tagged 1920s, 1929, Buddy DeSylva, Frank Luther, Leonard Joy, Lew Brown, Motion Pictures, New York, Ray Henderson, Sunny Side Up, Victor by R. Connor Montgomery. Bookmark the permalink.